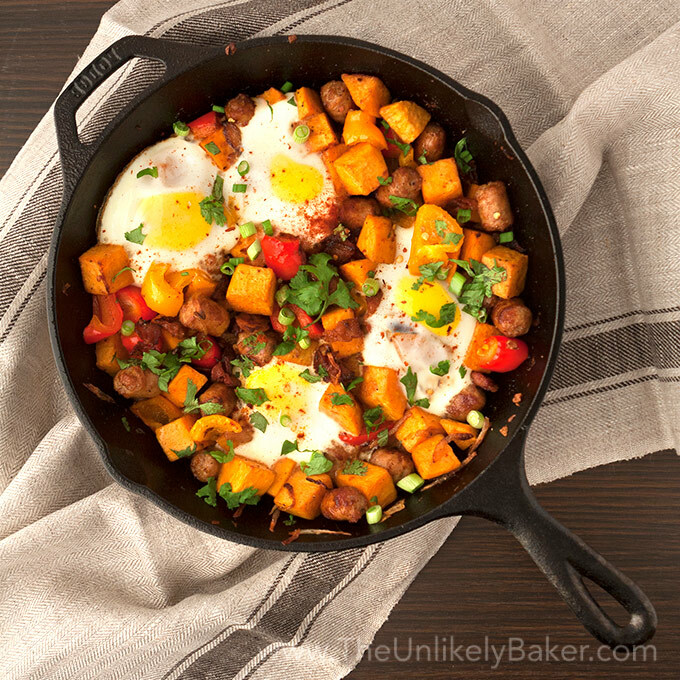 This sweet potato breakfast hash is delicious and filling. And with all the best things about breakfast – potatoes, sausages, bacon and eggs – in one pan, it’s a great way to start your day! Let me start with this disclosure: I did not make this sweet potato breakfast hash. Red did. Those of you who know me and who’ve followed my blog know that I cannot cook (our stove hates me and hot oil scares me) so Red does all the cooking at home. I will still take credit for the recipe though. I mean, I deserve it! Have you ever followed around a grumpy cook, constantly asking “what are you doing now?” in the hopes of documenting a recipe? And then proceeding to take pictures of the food while said cook who you’ve annoyed all morning sits there giving you the evil eye, waiting, hungry and grumpier than ever? I think not. So say no more. I do what I must to bring you the best, the most delicious recipes. 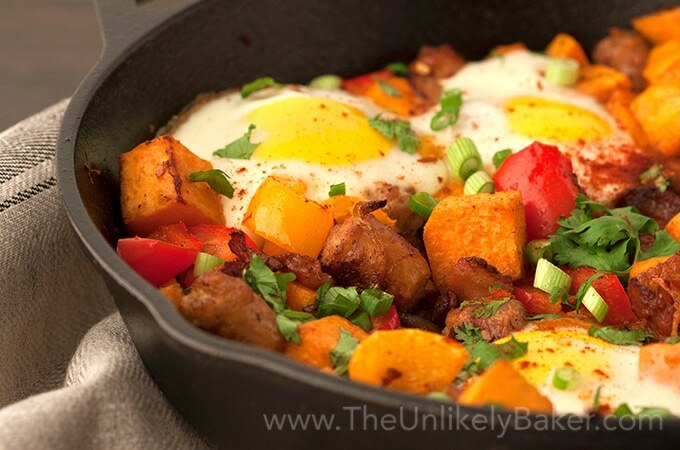 And delicious, this sweet potato breakfast hash is! It’s also a great way to clean out your fridge. If you’ve ever looked in there and thought what the heck are you going to do with that lone sausage, few strips of bacon, half a bell pepper and other things leftover from your other recipes – make a hash! You just need to have a piece of sweet potato as base, some eggs, and you have yourself a dish that the whole family will enjoy. You can use a normal potato; we personally just prefer a sweet potato – we find it so much more flavourful and it brings a delightful sweetness to this savoury dish. You can experiment with the toppings too. No bacon? Add ham. No sausage? Add hotdog (why not? It’s your hash). Then all you need to do is start cooking your ingredients in the stove and finish it in the oven. For how long depends on how you want your eggs. This sweet potato breakfast hash is so filling and delicious and takes no time at all (that is, if you don’t have a food blogger hovering over you lol). It’s also a great alternative to pancakes and other sweet breakfast options…though it goes great with pancakes too if you’re thinking of doing an epic breakfast spread. So tonight, have a look in your fridge. You may just have a delicious breakfast hash in your future tomorrow! All the best things about breakfast – potatoes, sausages, bacon, eggs – in one pan. 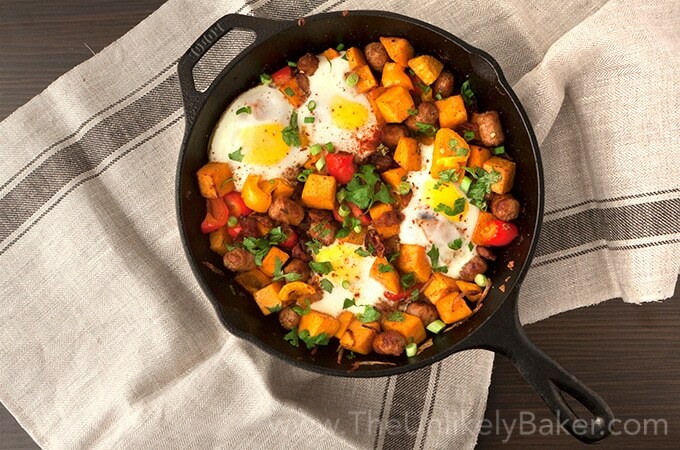 This sweet potato breakfast hash is a great way to start your day! In a medium sized oven-safe skillet, cook sausages and bacon on medium heat until brown. Remove from pan. Using the same pan, sauté shallots and garlic until translucent. Add sweet potato and cook for 5 minutes. Toss back the sausages and bacon, add the bell pepper, and stir. Add garlic powder, smoked paprika, salt and pepper. Stir to combine. Remove from heat and make 4 wells. Gently drop an egg in each well. Bake for 10-15 minutes until the eggs are cooked to your liking (15 minutes = hard boiled egg). Sprinkle with chopped cilantro and green onion before serving. 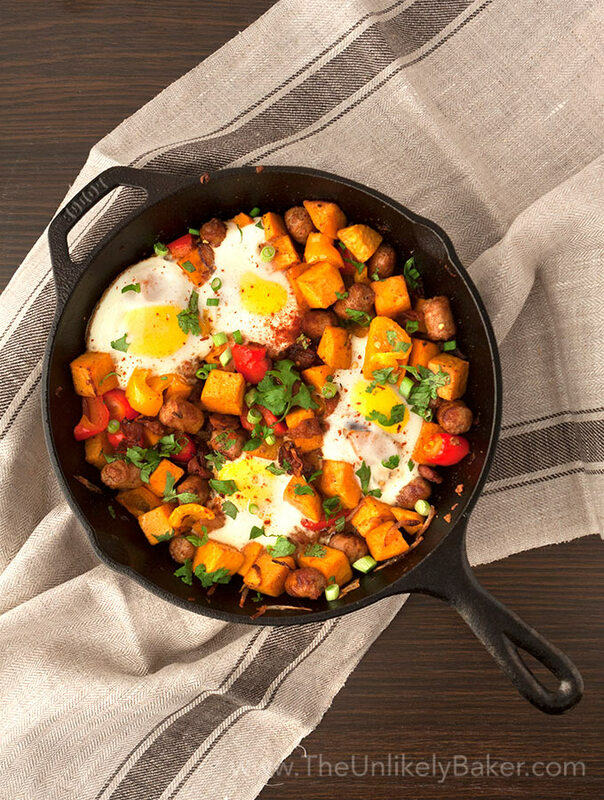 Did you make sweet potato breakfast hash? How did it go? Tell me about it in the comments section below. I’d love to hear all about it. Other savoury recipes are here. Could this be (before putting the egg in) put into little containers and stored in the freezer/fridge? I think I would be the only one eating this if I made it, and so I’d like to be able to just make some, put most of it away until I’m going to eat more, and then I can take it out, throw in the egg, and bake it. Looks delicious. Hi Paige. We haven’t actually done that so I can’t say for sure. What we usually do is cook it, bake then store the leftovers (with egg and everything) in the fridge. We reheat in the microwave and apart from the egg being more well done, it tastes just as good! Lasts 3 days or so. I think your plan would work too (my only concern is the sweet potato getting too soggy but baking might solve that). Good luck and enjoy! This looks so tasty. I made something similar to this. It had sweet potatoes, kale and topped with an egg. So good! Kale sounds like a tasty addition! I love anything sweet potato! Can wait to try this! I feel like you and I are on the same page. It is always my mission to finish off all the fresh food in my fridge before my next sojourn to the market. I make similar breakfasts to yours – lovely by the way – as a good method to get good value for money. Great looking breakfast. This made me hungry. I’ll be making this tomorrow! I love me some sweet potatoes! Never imagined mixing ingredients like you have shared. Must give this a try! This looks fantastic! I love sweet potatoes but haven’t had them in a breakfast! This looks delicious! Anything with sweet potato has my name on it. This is theBreakfast of champions! I can’t wait for your future savoury post . This would be a good breakfast and a great way to clean out the fridge as well. I will have to buy these ingredients though. However, I think I can make this hash everyday for free if I go over to my mom’s house. Her fridge needs some cleaning out. LOL. LOL yeah, I think all mom fridges need a little help getting cleaned out! I bet I’d find stuff in my mom’s fridge from November or something. Mmmmmm I am all over this! We usually make hash with plain ol’ potatoes. I love the sweet potato switch up! Hope you like the change Bobbi! Dear Jolina, this breakfast hash looks absolutely delicious! I would love waking up to this…such a hearty start to the day. OMGGG this looks so freakin yum!! Wow! it has all the ingredients I love in a dish. I love how bright the colors, so delightful. It’s bright and vibrant and delicious! Hope you get to try it some day soon! The hubby really likes sweet potatoes. He’d be happy to find this breakfast on his plate. Oh this looks so good! 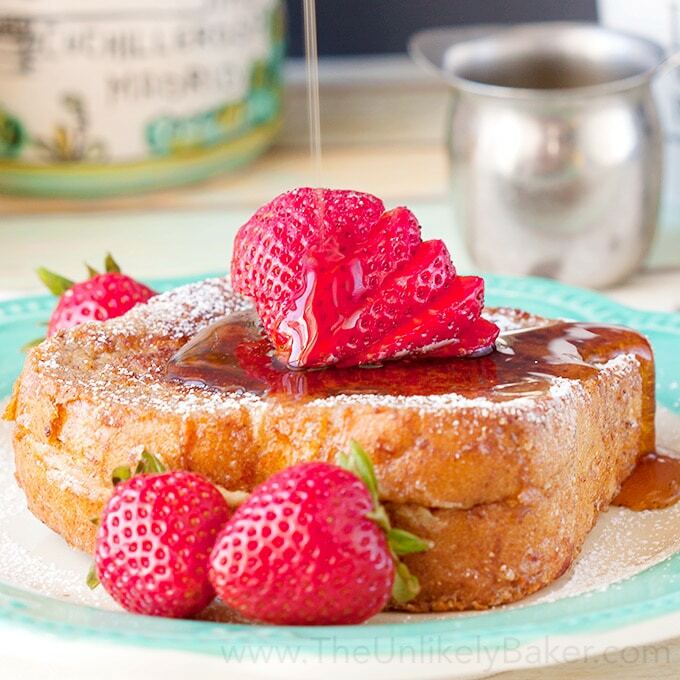 We like to have a good breakfast on the weekends, and this is one for us to make. Thanks for the idea! This looks so good – I’ve been doing a lot of fridge cleaning this way here of late. It seems like just about anything will work with some eggs and potatoes. Hash is one of my favorite ways to use up little bits of leftover meats and veggies. It’s a great way to use up all those odd ingredients right? And so good. Different variations too depending on what you have in the fridge 🙂 And yes, eggs + potatoes is always a great idea! I need to invest in a good cast iron skillet! That one you posted looks good and affordable. Is that the one you use? Yes it is, we got it for a pretty good deal too, 3 pans + cleaning scrubs 🙂 We love it, such a great investment! This looks delicious and filling! My husband would love this recipe. Oh my goodness, this recipe looks fantastic! This would be the perfect meal to kick off the day. Yummm I love a great breakfast hash. And the sweet potatoes make it even better! I don’t eat them enough so this is the perfect recipe to incorporate them more into my diet. Love it! Absolutely 🙂 Hope you like it! Wow this looks so good! I love breakfast hash. HAHAHA did you really? I knew I had to come clean. There was no way I can get away with it. ONE DAY though. I will cook something 🙂 This hash is something else (I feel guilty now, I think I must call it Red’s Breakfast Hash from now on teehee). Love it! If we need something quick and easy and there are things in the fridge nearing the end of their lives…hash day! Have a lovely week Dawn! Oh, yum! Hash is one of my family’s favorite breakfast foods. We’ve just recently started eating a lot of sweet potatoes, so this may be something we try. I had never thought of using sweet potatoes before. That’s my kind of breakfast! – hearty and totally delicious! My husband just started a paleo diet and I’ve been struggling to find things the whole family can eat and enjoy together. This recipe is a great addition to my arsenal! You are so right about someone asking you questions all the time!!! But hey a girl has to do what she has to. 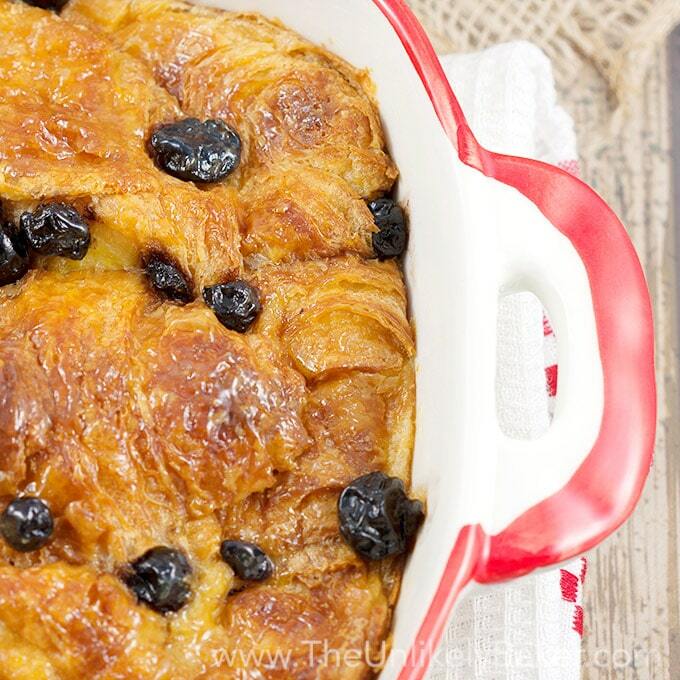 This is perfect for when you don’t want to scratch your head early morning but still want a hearty breakfast! Hahaha oh no. Were you at the receiving end? Too funny. I would learn to cook…someday…in the distant future LOL. And yes, this hash is definitely a put everything in a pan kind of dish 🙂 Have a great week Suchi! Oh man, I LOVE a good breakfast hash. This is a go-to for our family for cleaning out the fridge. I go back and forth with sweet potatoes and red potatoes. My kids have been picky about sweet potatoes lately (why??? ), so we’ve been using the reds. But I love them both!! LOL your kids are hilarious Mary. Maybe the colour looks weird for a potato? 🙂 Breakfast hash is great though eh? Just see what’s available and throw them together in the pan. Such a good and filling breakfast! Yum! These sweet potatoes look delicious! 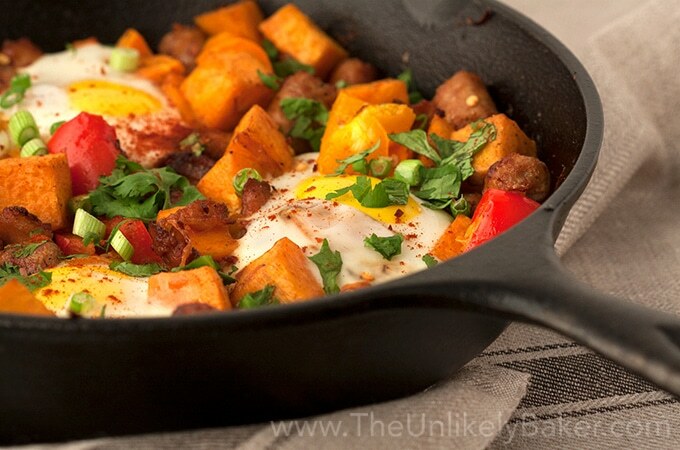 Love a good breakfast hash, especially one that includes sweet potatoes! This one looks so colorful and delicious too! Pinned!